The season is upon us and invitations to parties, gatherings and events will soon arrive. I’m often asked if attending a holiday party is necessary and, if, you do go, what to do and say and what to avoid. You can call it what you will : “Best Practices”, Strategic event management or common sense and good manners. The Holiday Party Do’s and Don’ts are all about appropriate socializing. Whether you self-identify as shy or as an introvert or an extrovert, holiday parties are daunting. So many questions arise: Is this business? Is it social? Is there a “time in attendance” requirement? Must I bring a guest? (Answers : Yes. Yes. Yes. No.) And so many more. Here are some holiday party tips to help with the season. Careers and relationships have been impacted by behaviors at the Holiday Party which used to be an opportunity for “Workers Gone Wild.” It’s best to go with the intention of having fun, connecting with others and, if this event is sponsored by your company or a hosted by a client or business association, err on the side of conservative behavior and dress. Before you leave for the event, doing your Holiday Party Homework will prepare you whether you are shy or introverted or just uncomfortable at gatherings. Prepare 3-5 items of conversation prepared…just in case. •	Organize a POTLUCK party or Holiday Lunch outing for your team or division if the company is not hosting one. •	Focus Your Conversation on the Event: The season is the reason. Bring your O.A.R. and start with small talk and the items you have in common. “Have any special plans for this holiday”? OR. “Who do you think made this delicious crab dip”? “My plans to be on the slopes for the holidays didn’t pan out.” OR “We decided to stick closer to home for a more low-keyed family holiday.” Add humor.” We’re calling it a “holiday-cation”. •	Act Like A Host (and a gracious guest): Be interested; pay attention; listen and introduce people to each other. •	Treat Spouses/Guests (yours and theirs) With Respect: Introduce them with enthusiasm and include them with eye contact, comments and questions. 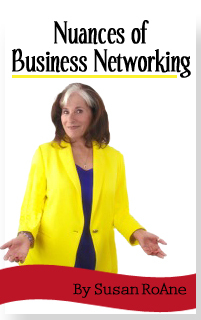 Remember: Holiday/Christmas Parties Are Still Business Networking Events! •	Don’t Drink Excessively. Enough Said. There is no such thing as “free drinks”. If one overindulges, there’s a price to pay. •	Don’t do anything that you wouldn’t want to see uploaded on YouTube, Instagram or Snapchat or posted on the internet. •	Don’t forget to detach from the techie toys (smart phones and digital devices). Refrain from text messaging, swiping left or right, emailing, status updating or tweeting when talking to people. Don’t post pictures or comments without permission. •	Don’t Kvetch, Whine, Ridicule, Compete, Correct, Interrogate or Brag. BONUS Holiday Party Tips: Dress appropriately for the occasion. Consider time, place and type of celebration. Tuck away your Tux unless it’s a black tie event. 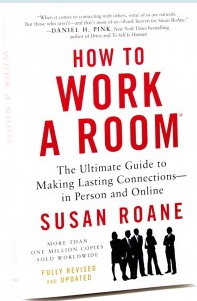 Holiday Party Do’s and Dont’s are based on Susan RoAne’s classic best-seller How To Work A Room®. Now available in the Silver Anniversary edition; in print, e-book and audio book.